It’s alive! The blog I’ve been putting off for ages has finally made its debut. I find starting a blog is always the most difficult part. Once you’re past that part, everything seems to flow with considerable ease. After culinary school, I jumped straight into work at one of the best pastry shops in Vancouver, Canada. It was an amazing year, and I learned so much more than I ever could have dreamed of, as well as working with the most incredibly rad team of pastry cooks and front of house staff. All in all, it was a fantastic year. Now however, I’ve scooted slightly further west coast to the island where I’m taking a year to study business management and take some time off to do lots of home baking/cooking. I also get to spend lots of time with my boyfriend and two of my best friends as we all live together in a cute little house with a pear tree. It’s been an odd transition- I used to wake up every morning at 4am to start work at 5am, working 10-12 hour days on the regular, and it got absolutely crazy during the holidays; 6 days a week, up to 15 hours a day. With very little free time that wasn’t spent sleeping, I crammed my weekends with as much as I possibly could, (to the great irritation of my boyfriend who wanted me to “just chill out for like a day please”) spending time with as many friends/family as I could and very rarely spending time in the kitchen. But now! I’ve had whole weeks with no real commitments, and man, it’s weird. I’ve spent a lot of it job hunting- which paid off recently when I got a job at a coffee shop near our house! Convenient and also practical, as I’ve always wanted to learn how to barista. One of the best parts of this new chapter so far has been all the free time I can spend in the kitchen. I love being able to throw things together that I imagine up moments before, and I’m lucky enough to have the time to stroll to the store and pick up the necessary bits and bobs, not just rushing to put something on the table, which is how I’ve felt in the past. I only recently got all my baking supplies brought over to the new house so I’m just getting started baking again. But meanwhile I’ve had a great time making dinner for my boyfriend! It might sound silly, but it feels like a huge luxury! I used to never have time to put together nice dinners, and I’m absolutely loving it. Right now, as we’re in that perfect crossover between autumn and winter, where it’s beautiful outside but still definitely sweater weather, I’ve been really into hearty meals with lots of fresh ingredients. As of lately, one of my all time favourites is this one-pan salmon. It’s buttery and flavourful, but also fresh and light and just straight up delicious. 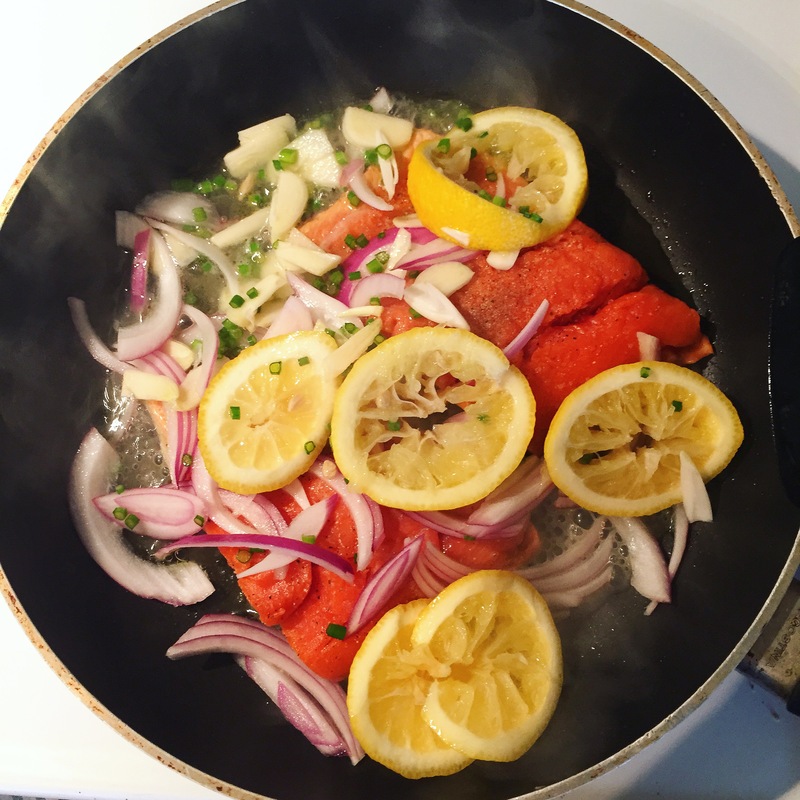 The veggies will soften in the butter and juices, while the salmon will absorb all the amazing flavours. Once the liquids begin to evaporate, the salmon will start to gain colour. Cook to desired colour and outer crispiness. Serve on a bed of rice or pasta, with wedges of lemon and fresh cilantro!